With President Maithripala Sirisena imploring the members of the Sri Lanka Freedom Party (SLFP) not to quit the unity government, there are signs that the crisis produced by the unprecedented defeat suffered by the ruling UNP-SLFP coalition is nearing its end. Sirisena is reported to have made this request to a set of SLFP ministers who met him today. While Sirisena was pushing for a UNP government not led by Ranil Wickremesinghe or else a new government formed with the support of the Joint Opposition, it now appears that neither can materialize. The anticipated moves within the UNP to oust Wickremesinghe did not happen and neither could the President’s hand-picked choice for the Prime Minister post, Nimal Siripala De Silva, get the numbers needed. 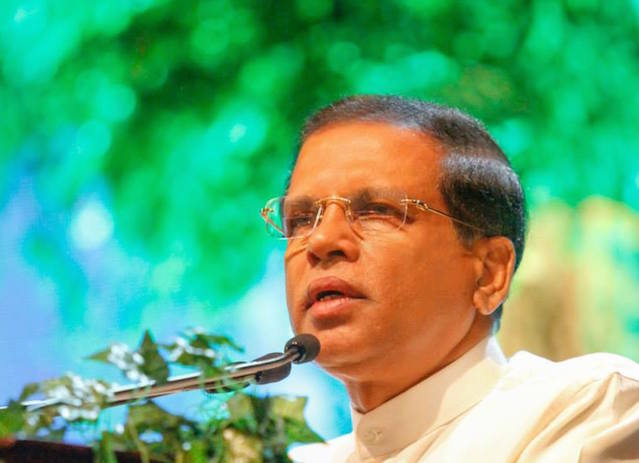 Consequently Sirisena appears to have reverted to what may have been the only choice open to him notwithstanding his rhetoric, that of giving the unity-arrangement with the UNP another go. It is reported that the decision was taken on Sunday (18) when he met with Prime Minister Ranil Wickremesinghe and the Speaker Karu Jayasuriya. Accordingly a cabinet reshuffle is scheduled for Wednesday (21), effectively bringing to and end all talk of alternative arrangements. Wickremesinghe, for his part, although expressing confidence of the UNP going solo in a new administration, appears to have backed down, either because he didn’t have the numbers himself or because the ending of the unity-arrangement was seen as a move that would strengthen the Sri Lanka Podujana Peramuna, the clear victor at the local government elections. There are unconfirmed reports that several SLFP MPs are to join hands with the Joint Opposition. As of now, there is no indication that the Opposition Leader’s post will be given to someone from the Joint Opposition, even though its political face, the SLPP, emerged as the undisputed voice of the opposition at the election. I heard the govt is asking Arrest warrents. But, court is not issuing those because it is asking ony for some cabinet ministers and not all. List includes members of all three parties but the the govt is asking only for some members. Maithri had a some “ketumpatha” to remove Ranil Wickrmasinghe. HE says I am not leaving he wants the law enforcement to investigate since his employment during the MRS B time which includes th eminister in GOVIGANA SEVA department.MAhinda Rajapakse is asking Ranil not to step down. But Ranil is saying “mama Dannawa umba mokada kiyanne Kiyala”. I am waiting here until the words i the Ktumpatha” is coorrected. Some one from Vijithapura. He had said, keep it in the closest deputy director’s office. HE is probably a She with short hair and she is used to sing Melaaya kohenda Olimda Kelan Genawo”. Se what Anura Dissanayake of JVP had to say in the Parliament. during the last general elelction, TV, Radio and newspapers all Mahinda Rajapakse’s fans. the same thing has happend during this elections most local newspapers had not published what Ranil did. One thing That public knows Ranil had used money to win the budget – that he has Offered 20 million each to 15 members (that should be TNA). Again he has given 50 millio to each May be for the elelction. voters are pissed off with Ranil they complain they did not do anything to us. We are really struggling here. but, this is how Ranil is doing. There are other complains too. Mahinda Rajapkse says, NEwspapers di dnot inform. So, I informed the voters. Peole say, We don’t have money buy tickets even for the “dolosbage ???? ?” movie which is about the corruptions in the Insurance corporation. What really happening is , It looks Ranil has not allowed the movie theators to reach the copy of the movie. Instead, Copies of old movies had arrived. People were solcing “Me mona seppada vijjawakda. Ranil doe snot wanrt to step down, he knows if he steps down that will be the end of his politics. HE is saying, in the parliament, I came to rule with the dasa rajaopa dharma but I could not complete at least one and MPS had sarted booing. (in shirt) police also had come to settle itI heard. It was a narrow escape for Sri Lanka!!!!! JO has no principles. JO driven by greed were even ready to pass the power to Ranil for cheap political gain to fulfill their personal grudge against the President. Nothing will happen to the President as any move to remove the President will backfire on the country. Ranil is unpredictable. If JO thinks he will act according to any agreement between them after grabbing power, they are mistaken. President will be protected by the most powerful Sacred Tooth Relics which will thwart any attempt to unseat him until the next Presidential election in 2019/2020. Anyways he should let the Chairman/Elections Commission go, who has deals with both Ranil and Basil, if he wants the next Presidential Election be free and fair. Otherwise the election results will be decided by money and affluence. President should make sure to hand over the country to a man who is genuinely love this country who is yet to come forward. There are people who can make things happen. Anyways, the ruling power of the country will fall onto somebody’s lap without much trouble. That is the message conveyed by those 5 million voters who boycotted the LG election. The post LG Elections scenario,in the political domain was akin to where the PM: Ranil Wickremasinghe may very well ask et tu Brute. MaRa asked this from Maithripala Sirisena at one time, after a Hopper feed. Jackol Opposition is called now Sikuru Tharuwa. that is they come early morning, after while it is gone. Itis the same thing in the when the dusk comes in. JP is LSSP that is all the eternal losers and destrouers ot he country, LEader, ORganizer and the mouth piece preaching rhetorics are three different people. IF Ranil is allowd to stay, UNP will disappear that never to come. Only thing is people will acuse you are living with ILIKUNNAS. IF there is a good party constitution which allows new blood to come – can be done easily -and a stronger executive president but surrenders to the law when nosandala things are done, can make things work. I heard ETCA is still being discussed. India’s demand is in order to keep good indian – Sri lankan rrlations Sri lanka should provide employment for at least another 10,000 Indians. That is why Ranil is saying we have a democratic govt and we have to invite required foreign labour from India. I think he mentioned that in political meetings. He thinks that we cannot do anything without the involvement of India. Thsoe MAdras Malayali ?) says take our people too. but, they do not give employment to Sri lankan there. they bring even the cigarette from India. Ranil’s SAmmuthi govt never worked and will never work. No, no Sammuthiya is working to protect MR & the clan & bond scam culprits. What is happening today was foresaw by Ranil when he assumed Premiership under this government.Only he and noone else undestood the fact that 19th Amendment would become a strong protective wall saving his position during this term itself. All media and the electorate and the president himself personally used maximum power to pull him down. All of these efforts ultimatlely became utter failures. Compare this with 18th Amendment. Mahinda brought this during his first term to remain in power for lifetime but failed even to enjoy statutory period of pre18th. Political ingenuity and wit……. I heard it is RAW that wants Ranil in. the Reason is Ranil is fully for Indiannization of Srilanka. Ranil says Do not grow anything in Sri lanka, do not make anything in Sri lanka. Import everything it is cheaper. On the other hand, Indians coming to Sri lanka they want to bring everything from India. they prefer “DESI” ingredients to local ingredients. IF you ask the why their product prices are high that is what theysay. Only their ingredients are high quality and not Of Srilanka’s. they say even water Bona wathura or dirnking water of ours is not good as their PAANI water (Paaneeya jalaya) which comes from India. there are RAW groups in Srilanka changing the country demography in every way. This is very true. While our fellows are engaged in cheap political games to grab and/or retain power undermining and destabilizing their own country, other countries especially India, taking advantage of the anarchic situation to invade all our sectors, health, economic, trade, shipping, IT, education, seed&germination, everything. These politicians should be recycled. President I think has already got the political situation under control. Never mind, you hear all sorts of voices in your head all the time. It was Hindia that got Ranil a boot from Chandrika in 2004 when he was the prime minister for his effort to bring in international safety net. Then Hindians brought in MR and paid MR to buy VP. VP won the elections for him. Did you hear him good? He might have told you to grow some brain. What do you produce that they can comfortably consume? Do you manufacture/produce sambar podi, kuruma masala, rasam powder, Idly mix, fennel, turmeric powder, black gram, ragi, perungayam – asafoetida, …………………………………….? You lazy bum get your producers to manufacture the stuff others want to buy instead of moaning and groaning, ……………….. They even produce good quality kancha hence they won’t buy yours. Why don’t you get the government to help produce “Ginseng” thought to be a natural Aphrodisiacs. There is a large market for Aphrodisiacs in India and here. You can sell Indians tourist in tons. They seem to spend large amounts on western manufactured drugs.